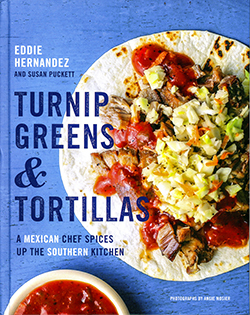 Mexican chef Eddie Hernandez serves up his own blend of Southern and Mexican cuisines in his new cookbook, “Turnip Greens & Tortillas: A Mexican Chef Spices Up the Southern Kitchen,” co-authored with food writer Susan Puckett. Hernandez is the executive chef and business partner of Taqueria del Sol, with locations in Georgia and Tennessee, and a James Beard nominee for a 2017 Outstanding Restaurateur award. In the cookbook’s more than 125 recipes, readers will find a wide range of Southern dishes with a Mexican twist. In addition to salads, entrees, sides, desserts and beverages, Hernandez includes recipes for salsas, dressings, spice and coating mixes, barbecue sauces, vinegars and corn tortillas. Color photos accompany many of the recipes. Hernandez also explains in detail the specialized tools, equipment and ingredients necessary for the “Mex-American” kitchen. The emphasis is on simplicity and affordability: “We Mexicans tend to be thrifty by nature because we are a poor culture. That’s what makes us such good cooks!” he writes. “Turnip Greens & Tortillas” is available where cookbooks are sold. Price is $30 for the 288-page hardcover.